A great remaster and the usual high end packaging make this the definitive version. 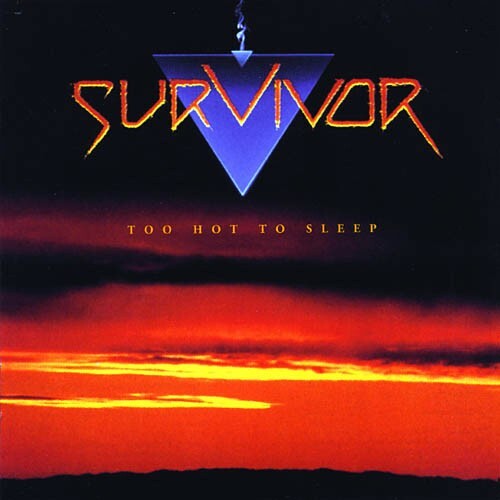 It's rather fitting that the Rock Candy reappraisal of the Survivor back catalogue should end on a high with their last album of the 80's, the oft overlooked and to my mind criminally underrated 'Too Hot To Sleep'! Both bassist Stephan Ellis and drummer Mark Droubay had quit the Survivor ranks following the relatively poor commercial showing of 'When Seconds Count' – the latter in search of pastures new, whilst the former was forced to step down due to ongoing health issues – which just left the central songwriting nucleus of Jim Peterik (keyboards), Frankie Sullivan (guitars) and Jimi Jamison (vox). Utilising a stand in rhythm section (old pal Bill Syniar from Chicago on bass, and respected session drummer Mickey Curry, who by then had forged a formidable reputation working with both Hall & Oates and Bryan Adams) the trio went in search of their hard rock roots, in the process producing their heaviest album since 'Premonition' and arguably the heaviest Survivor album period. If you look at it from an accountants perspective, in purely commercial terms 'Too Hot To Sleep' was even less successful than its predecessor (in truth it barely dented the Billboard Top 200), but along with the aforementioned 'Premonition' and the truly awesome 'Vital Signs', to these ears at least it represents the best thing the band ever recorded. First of all Sullivan's guitars were pushed much more into the foreground, this time used to define the songs with Peterik's keyboards offering splashes of colour instead of the other way around. This heavier sound in turn seemed much more suited to Jamison's grittier vocal style, as had been amply demonstrated on the Cobra album 'First Strike' some five years earlier, which if we're honest was probably what landed him the gig in the first place. Fortunately, this revamped approach didn't affect the quality of the song writing one iota; the hooks, the melodies and the emotional investment remained as strong and vibrant as ever before. Brooding, low slung anthems like 'Rhythm Of The City' rubbed along quite nicely with upbeat rockers such as 'Desperate Dreams', together creating a head turning cocktail of sophisticated songs drenched in melody and power. From title track 'Too Hot To Sleep', to oh so memorable cuts like opener 'She's A Star', 'Here Comes Desire', 'Across The Miles' and 'Can't Give It Up' there isn't a single filler on the whole album ... a rarity even then. 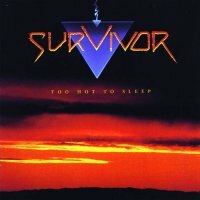 Had they continued in this vein, Survivor could have quite easily left their pop rock / AOR roots behind them and carved out a second career as a successful hard rock band ... sadly, everything drifted after this release and the band would never be the same again. No bonus cuts this time around, but a great remaster and the usual high end packaging still make this the definitive version.